Store DJ has always pushed the boundaries. Launched in 2000 in a small shop in Bowen Hills, Brisbane, Store DJ was the first DJ store in Australia to specialise in both a physical shop front and online store that offered advice and support to Australian DJs. Operating in the B2C space means you need to understand the way your consumers want to engage with you, and Store DJ’s Managing Director Jeremy Leitch and his team are definitely tuned in to knowing what their customers want. To continue being the best in their space Store DJ needed to take their online business to the next level, and when they turned to Commerce Vision we knew we had to take it up a notch. Store DJ’s customers are savvy online users, well versed in technology, and we needed to give them something that was intuitive, responsive in design, and feature rich so they would use it as the go to place for all their needs. We worked with Store DJ to produce a site that would help the business reduce its cost to serve, give them a comprehensive online presence, and provide their consumers with new and enticing reasons to focus their interactions online. 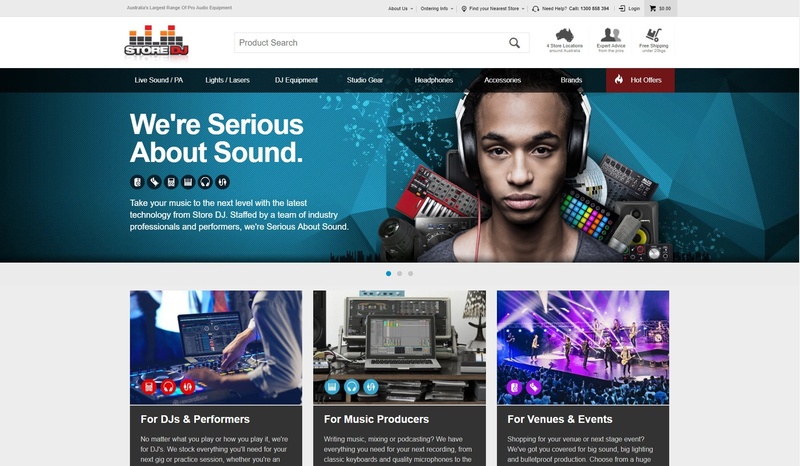 After turning to Commerce Vision, Store DJ have been able to provide a world class experience to their users with the right mix of technical detail and brand knowledge. With an increase in sales for the last two calendar years of over 75%, it’s not hard to see why the relationship between our companies remains strong. Store DJ has now moved their focus into expanding both their capacity and the reach of their brand while keeping that signature style of being the go-to for quality products and quality advice. Commerce Vision remain dedicated to helping Store DJ provide a web and eCommerce experience that is the benchmark for the industry. With the assistance of Commerce Vision, the introduction of Paypal Express, and many dedicated team members, Store DJ has confirmed an incredible increase in conversions of >75% since June 2012. With 33% of their turnover now being attributed to the online space, it's easy to see how successful they already are. As to the future? The tables never stop turning and both Zip Money and Click and Collect will be dropping soon.